Anna “Anne” Teresa Perritt (nee Nekich), died peacefully on the morning of December 12, 2018 at the age of 98 years. She was born in Lorain, Ohio on August 25, 1920 and had resided in Lorain for the majority of her life with a few years also spent in Elyria. Anne was a homemaker and had previously worked at the National Tube Company, Western Enterprises, and Finance Manufacturing. She was a parishioner of the former St. Vitus Catholic Church in Lorain, and was also known at St. Peter Parish. 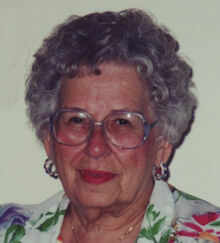 Anne was an avid bowler who won several bowling trophies; she also loved to golf, paint ceramics, cook, and read. Her favorite pastime was spending time with her family and friends. She was preceded in death by her beloved husband Stanley in 1995, parents Matt and Anna (nee Dragevic) Nekich, sisters Rose Doslovich and Katherine Mlakar, and brother Jacob Nekich. Anne is survived by her niece Dorothy Myosky of Amherst and nephew Jake Nekich of Fort Myers, Florida. Additional survivors include thirty-six great, great-great, and great-great-great cherished nieces and nephews.